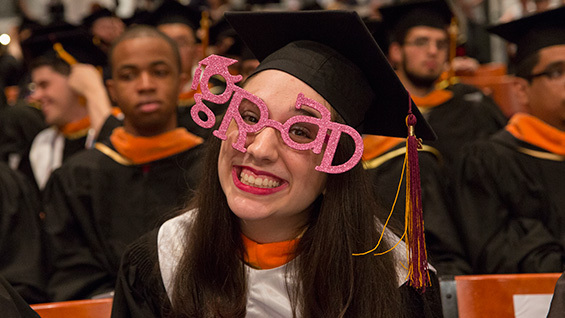 The weather was lovely and spirits were high as graduates and their parents, family and friends filed into the Great Hall on May 27th as the 156th graduating class celebrated its commencement. See the photo highlights. After being led in to the hall by pipes and drums the students took their seats. Stephen Baker, vice president of student affairs and community relations, acting as Chief Marshal, officially presented the class of 2015 to great applause. The Coopertones, an a capella group made up of students, including Quinee Quintana, sang the national anthem. Reverend Siobhan Sargent, associate pastor of the Church of St. Paul and St. Andrew United Methodist delivered the invocation. After a greeting by Richard Lincer, chairman of the board of trustees, the ceremony continued with the presentation of the student awards. William Germano, dean of the faculty of humanities and social sciences, presented them. The Jacques and Natasha Gelman Trust award went to Kristi Cavataro A'15. The Harold S. Goldberg Prize went to Alyssa Davis, BSE'15. The Toni and David Yarnell Merit Award of Excellence in Architecture went to Arta Perezic AR'15. The Toni and David Yarnell Merit Award of Excellence in Art went to Omari Douglin. President Jamshed Bharucha then delivered his address in which he noted how he arrived at The Cooper Union four years earlier, just as did most of the graduating class of 2015. He drew parallels to their experiences. "While you were plunged into your courses, I was plunged into my own self-study course on Cooper's finances. I know your courses were challenging. Mine was too. Your courses transported you to imaginary worlds, pushing the limits of thought. Mine did too." Following his address, President Bharucha conferred the Honorary Doctorate in Humane Letters to Milton Glaser A'51, famous for his illustrations and designs including the "I Love New York" logo. In his commencement address, Mr. Glaser related some personal highlights of his years since graduating. "Almost every good thing that's occurred in my life I owe to this institution," he said, "and I believe that will be true for everyone graduating today." Harrison Cullen BSE'15 gave a student address urging the graduates to continue to interact with each other. "Cooper Union is a way of existing in the world that preceded the school and preceded Peter Cooper himself. Being by means of doing has built this school's foundation. We not exist within a bubble and it is of the utmost importance that we bring our action beyond our own walls." Students then filed up to the stage to receive their degrees. Afterward, as they proceeded out, some may have carried with them the final words of Milton Glaser's commencement address. "Graduates of the class of 2015: go forward, leave fully and change the world. You have been well prepared. Be generous and remember where you came from."